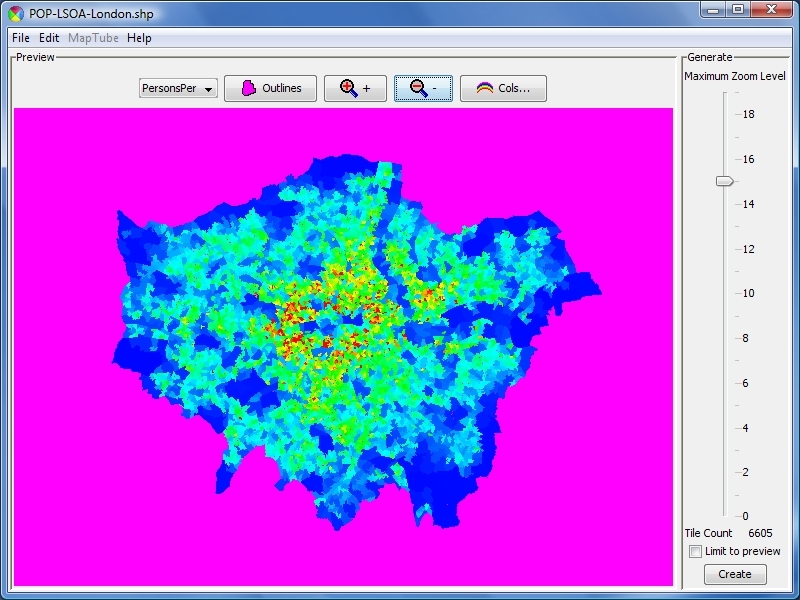 MapTube, the new mapping site from our lab CASA at University College London to view, overlay, mix and match choropleth maps now includes a free creation tool. Google Map Creator provides a quick and free way to convert .shp or formated .csv for viewing in Google Maps and MapTube – allowing datasets to be quickly and easily shared and visually compared against any other data on MapTube. In short it is perfect for local councils, government organizations, academics and general users who want to view and share their data in the easiest way possible. Unlike the Google Maps API method for displaying points, lines and polygons, Google Map Creator renders the map information as a series of raster image tiles (256×256 pixels) accordingly to the level of zoom required. This protects the raw data, easing issues of copyright and data sharing while allowing any dataset to be mixed, matched and visualised with any other data on MapTube. Before uploading to MapTube, maps need to be created from shapefiles using the Google Map Creator tool and placed on the web. Maptube takes a link to this location and creates a new map reference from the information found there. Copy the url of the settings xml file into the XML URL box and click ‘Test’. Fill in the rest of the information on the page and click on ‘Submit’ to upload the map. We will be featuring a MapTube Map of the Week – currently The Credit Crunch from our work with BBC Radio 4 – on Digital Urban and while its difficult to be unbiased about MapTube (as we are part of it) it is a notable change in the ability to view, share and visually analyse geographic data online…. See http://www.maptube.org/help-createmap.aspx for full details and as ever any thoughts are welcome. It’s a nice site, but I’m wondering why http://www.maptube.org/map.aspx?mapid=97 has such an odd scale. It’s meant to show a percentage (of people who are of English origin), but the scale seems to be 0 to 251+. The map doesn’t appear to have anything on the scale above 100 and < = 100 gets only two colours which makes the map somewhat less distinct... Also, the ‘more information’ page has some text like ‘read more’ that doesn’t actually link anywhere. I look forward to seeing more interesting maps!